In 1988, an international exhibition opened in Venice, Italy. "The Phoenicians", was curated by Italian archaeologist, Sabatino Moscati. In an article by "The Smithsonian" (magazine), August, 1988, Moscati points out the exquisite rightness of Venice to host it (the exhibition); in glass manufacture, "the Phoenicians were the precursors of the Venetians". Old Phoenician Head from 400 B.C. Four different Phoenician head styles were shown, purported to have been found in a tomb in the ancient city of Carthage. 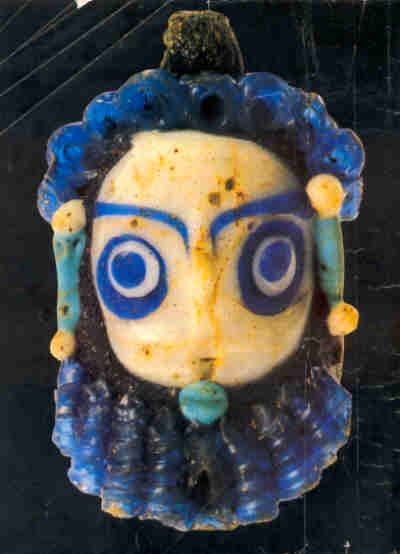 The lustrous glass necklace pendants are believed to represent a deity dating to about 400 BC. A local Murano glass artist of our acquaintance, took a commission from a Roman museum to recreate the heads. We have carried them since 1988, and for the first time, offer them on our website, either as a necklace or as loose pendants.